Springs are the foundation of good handling and ride quality. So start with the best springs for your 2015-2019 Ford S550 Mustang EcoBoost, built by the company that specializes in vehicle dynamics and your Mustang! 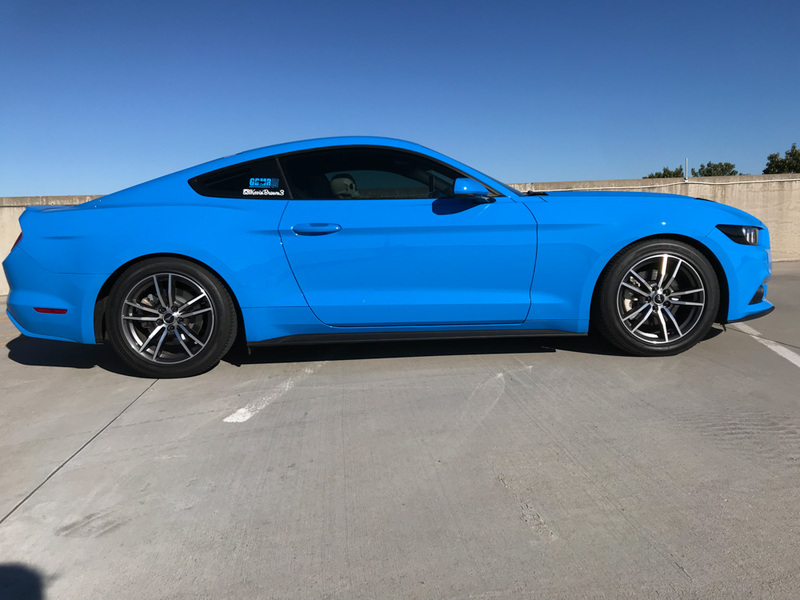 These Steeda Mustang Sport Progressive Springs optimize the center of gravity and suspension geometry creating a huge improvement in handling with a noticeable reduction in nose dive, launch squat, and body roll, while still maintaing an outstanding ride quality for daily driving. Purchase your Steeda Mustang Sport Springs - Progressive for your 2015-2019 Ford S550 Mustang EcoBoost at Steeda Autosports today! Absolutely great springs, ride quality is comparable if not better than stock, almost perfect drop to close up the wheel gap without going low enough to worry about hitting things in the road! No more wobbly or bouncy feeling and stance is great. Helps eliminate body roll and you can really push into the corners a lot better. This is how it should of came with the performance package kit from Ford. No more wobbly or bouncy feeling and stance is great. I get tons of complements on my car and wanted to say thanks! I have used your springs on my 2013 mustang GT and when I bought my 16 the lowering springs was my first purchase! I also added the g trac brace and will be purchasing more suspension parts soon! Thanks for making great products. I've noticed that nose dive on heavy braking is about non-existent now. And while I haven't had a chance to push her hard in the curves, the handling seems to be better. The car just feels more planted to the road. I had the Progressives installed yesterday, took the tech f o r e v e r! But patience is a virtue as they say...The drop is puurfect IMO! Not too low but definitely gives the car "the look" I wanted. I had an opportunity to see just how the Springs perform this morning, the roads I take to work are windy, curvy, hilly, an enthusiast's dream. The car now handles like it should have from the factory, I couldn't be more pleased. I now have ZERO wheel hop! I forgot to update this after installing the Steeda springs and wheel hop kit, I've had them on for a couple weeks now. I'm loving the look with the springs, and there is definitely a noticeable difference in handling. Ride quality suffers a little, but it's not terrible. The wheel hop kit (IRS subframe bushing support system) does exactly what it's advertised to do, I now have ZERO wheel hop! I can't tell you how much grief my wife has given me over my decision to lower my S550. In her defense, I've lowered my last 3 cars and made all of them to the point she hated to ride in them. The last one I even tried 2 sets of springs and 3 damper solutions. It got a "barely livable" rating from her on the final setup on that car. I just got the Steeda Progressive lowering springs installed, along with the front and rear sway bars with billet mounts. I've heard others here say good things so we were optimistic, well at least I was. I think I may have over-sold it just a little based on comments I heard. It didn't completely get rid of the bumps but they are much better. I'm not talking about bumps like bridge buckles, they are VERY nice now, way better than stock. I'm talking about the aggravating bouncing my EB PP had just riding down the highway. I'm not saying it doesn't bounce, it's still there but better. That alone to me is AMAZING! I lowered the car, the handling is FANTASTIC now AND at the same time, the ride got BETTER! I gotta say I'm still SHOCKED! I was to the point that I just believed that with the reduced spring travel you will always have a rougher ride. The fact that my wife actually likes the ride better now to me is INVALUABLE! It means that spending money for the next mod will bring less scrutiny. The car looks so much better lowered. I can't really say how much of the handling is attributable to the springs since I did the sway bars at the same time but the combination is just fantastic! Thank you [email protected] for the recommendations! What I did notice immediately was how easily keep it is to spin the rears now as the stiffer springs transmit the torque straight to the tire. Fun! I'm very impressed with them so far. They are just a little firmer than stock but really control roll and nose dive. They seem like the perfect spring for a daily driver. The car sits perfect with these springs. The ride is amazing, to be honest. The nose dive on braking has been reduced great,y. The car is very flat when cornering and just begs to be pushed more and more. One thing that seems to have greatly improved is the response of the initial turn in. It is very, very responsive. I assume it's a combo of the springs and sway bars but not sure which contributes more to it? I set the front sway bar on the 3rd setting, one away from the firmest and the rear one is set on 2, one away from the firmest.